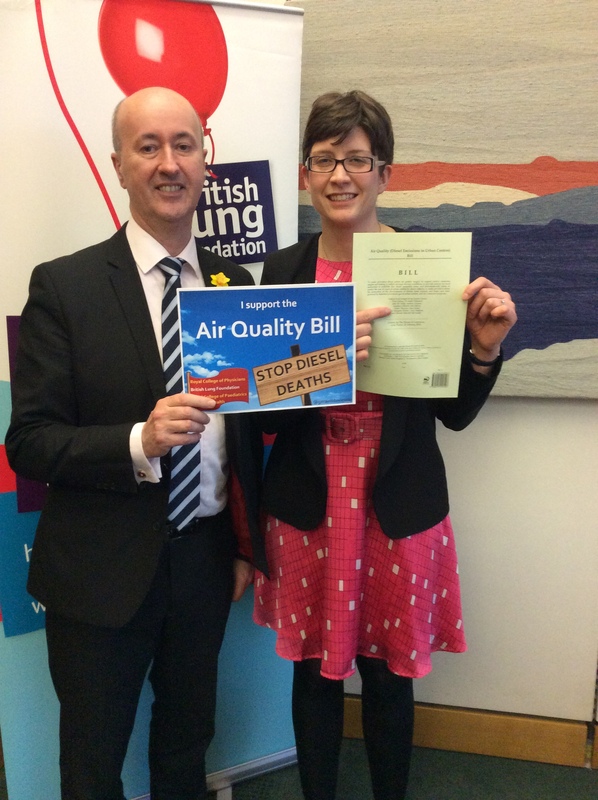 Alison Thewliss MP is supporting the Air Quality Bill, published yesterday with the support of the British Lung Foundation, Royal College of Physicians and Royal College of Paediatrics and Child Health. The Bill, presented by Geraint Davies MP, follows a report from the Royal Colleges that diesel fumes cause 40,000 premature deaths every year from lung cancer, strokes and heart disease. Diesel fumes also lead to underdevelopment in children and impact on foetuses, among other health effects. The Air Quality Bill makes provisions for emissions testing to reflect on-road driving conditions, and assessment at the point of MOTs. The Bill also empowers local authorities to designate low emissions zones and pedestrianisation, and promotes cleaner public transport alternatives such as tram systems and LPG-powered vehicles. The Environment Agency would be able to step in when a pollution cloud has hit an area, so that windows, doors and even roads can be closed, and if necessary local people evacuated until it is safe to return. Alison Thewliss MP said, “Diesel pollution causes 40,000 deaths a year, and costs £20bn according to the Royal College of Physicians. That is why I am supporting the Air Quality Bill, published today, which aims to save thousands of lives and billions of pounds. This is achieved through effective emissions testing, following the Volkswagen emissions scandal and promoting greener transport systems and vehicles.